New technologies, better transit options, and improved urban design can lower greenhouse gas emissions, reduce air pollution, and improve quality of life. Cars and trucks are responsible for 33% of green house gases in LA County. 25% of land in LA County is used for roadways and parking, these surfaces increase heat and reduce air quality. 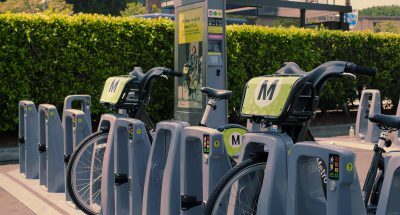 LA County Metro is building more new public transit than ever before, the City of LA is implementing a great streets program, the South Bay Council of Governments is developing innovative place-based transportation. Los Angeles’s transportation system is undergoing a revolution. LA County Metro’s plan to expand rail and bus services is the largest current public works project in the country. The Southern California Association of Governments’ Sustainable Communities Strategy lays out a set of transportation, land use, and housing strategies to reduce per capita VMT 8% below 2005 levels by 2020. Rapid innovations in technology are enabling new modes of transportation – such as ride sharing services, improving access to public transit through real-time information, and reducing vehicle tailpipe emissions through vehicle electrification, more efficient vehicles, and lower carbon fuels. This transformation has the potential to reduce greenhouse gas emissions in Los Angeles while improving public health, mobility, and the regional economy. Integrate payment systems across agencies. Establish public and private partnerships between car-sharing companies, bike-sharing companies and transportation agencies in order to test and improve synergies for users. 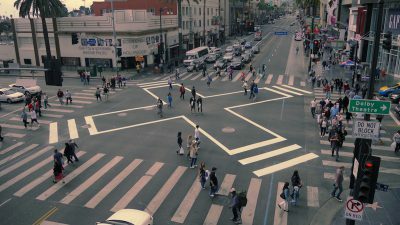 Design streets to increase the safety and reliability of multiple modes, not just cars (while also enabling multiple modes and revising road standards to create opportunities for walking and biking by narrowing roads and breaking up large blocks in to smaller ones, among other strategies). Promote telecommuting, "alternative" work schedules (4/40 or 9/80), and flexible work hubs. Coordinate street signal syncing to improve the service of multiple modes. Unbundle the price of parking from the price of housing. Remove or significantly reduce minimum parking requirements for new development. Establish parking maximums for new development. Allow different land uses to share parking spaces since different activities have different peak demand times. Manage curb space for passenger loading near front doors, delivery zones, disabled parking, and car-sharing spaces as well as transit stops. Ensure employers offer financial incentives to employees to use alternative modes to work (such as the Parking Cash-Out Program (PCOP) created by AB 2109 (1992) and implemented until recently by the Southern California Air Quality Management District). Create variable priced street and off-street parking based on demand. Allow project developers to substitute bicycle parking for vehicle parking. Encourage car-to-go or other short term vehicle rental programs to develop an infrastructure in the region. Provide easy access to real time transportation options and costs across multiple modes and providers, including for private transportation providers and multiple transit agencies. Enable data access between transportation agencies and partners. Develop plans, strategies, and partnerships at the county level, such as through the Los Angeles County Metro or a joint agency consortium, to build a system of shared mobility. Develop public private partnerships that prioritize sustainability. Plan and develop an integrated system of electric vehicle charging stations across the region that is coordinated with public transit and other modes. Create and fund an inter-agency working group between Los Angeles County Metropolitan Transportation Authority and the Los Angeles County Department of Public Health. This group will work to identify appropriate indicators for measuring the interaction of public health and transportation (focusing on those stressed by climate impacts), quantify those indicators, set future goals, work across the two agencies and with other departments to coordinate action and integrate goals, and track progress towards successes, as well as regularly reevaluating goals as needed. Identify urban heat island priority areas to target efforts. Identify and apply for co-funding opportunities to retrofit and upgrade permeable surfaces and develop new codes to encourage retrofits of privately owned surfaces. Coordinate research and development efforts to develop rating systems and guidelines for appropriate materials. A joint research and development effort can secure funding for product development and enable pilot projects to be tested under a variety of conditions. Public facilities (such as parking lots, access roads, etc.) provide a tremendous opportunity to test new product durability and safety standards. Create and fund an inter-agency working group among Los Angeles County regional leaders to initiate a comprehensive and detailed infill locator study for the region. The effort can use information already developed by SCAG, the county, and cities within the county. Those data can provide a foundation for tailored policies to prioritize infill in terms of location and type (e.g. housing affordability range and mix of uses to foster walkability and transportation investment and choices). The study should make use of a platform capable of supporting broad stakeholder engagement, transparency of results, and durability of the information for implementation and monitoring. The regional effort can be modeled on the 2005 infill locator study conducted by UC Berkeley for the state’s Business, Transportation and Housing Agency. Set regional infill goals regionally and locally, based on the study and achievement of minimum densities to support transit and walkability. in single-family neighborhoods where transportation choice addresses potential traffic impacts; and regionally and locally tailored by-right options for infill where impacts are addressed.